Ahh the small details of weddings and wedding photography. It's very easy, especially for a new wedding photographer, to get caught up on the really big details of the day. The groom's suit, the bride's wedding dress, the venue etc. But the devil really is in the details when it comes to amazing photography and one place that I like to start is with the wedding rings. Here is a prime example of what I mean - gone are the days of a cliche photo of the bride and groom's hands overlapping in a pose that you should only see in weddings from before 1980. It is the 21st century after all, so your wedding photos should look like that! That's not to say that you can't take traditional photos, it just means you need to do it in a new way. 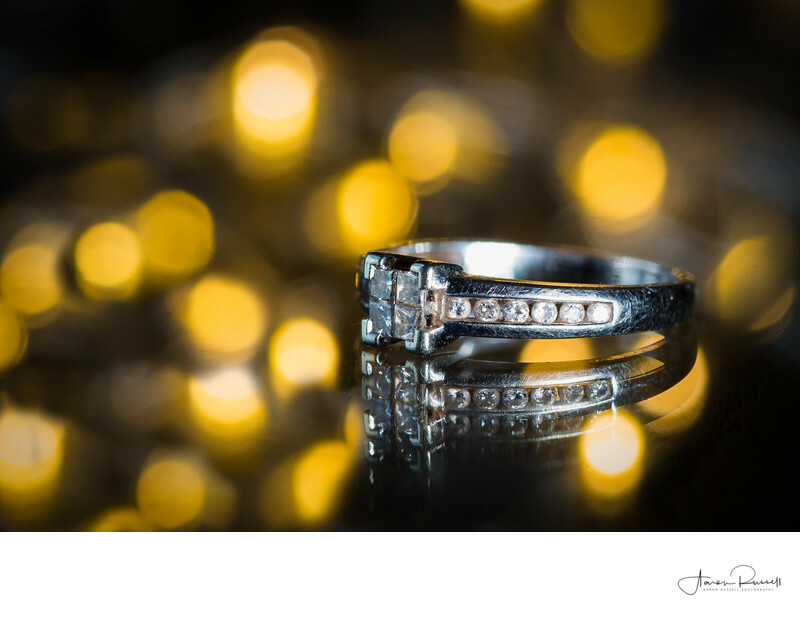 For this stunning wedding wedding photo of the bride's engagement ring I found a highly reflective black polished table that I could place the ring on. In the background, fairy light provided the perfect backdrop. The large globules of light add a glorious amount of colour the the image, and a splash of flash from a well positioned light means that the ring just glows. This is how you do a modern take on a classic photo.